I enjoyed a dip like this at Humpy’s Ale House in Anchorage, Alaska so much that I decided I needed to make it at home… with a few improvements! 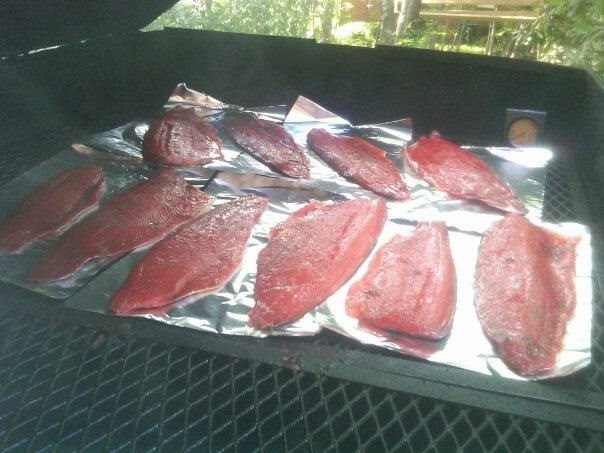 For the smoked salmon: Wash fresh fillets of wild Alaskan sockeye salmon under cold water. Pat dry. In a large bowl, mix 2-3 cups coarse sea salt (Korean markets sell it in large bags), 1 T coarse cracked black pepper, 3 T chopped fresh dill weed, 2 T chopped fresh oregano flowers, shredded zest from a lemon, and 3 T light brown sugar. In a plastic pan large enough to hold the salmon, line the bottom with a layer of the salt mixture. Arrange the fillets on the salt. Pack the remaining salt over the fillets. Refrigerate for 1-2 hours. Remove from fridge. Rinse salt from the fillets. Some pepper and dill will adhere to the salmon. This is OK. Pat dry and place on racks. Air dry in the fridge or on a counter top under a fan until a pellicle forms on the salmon ( a dry skin). Heat smoker to 90F. Create lots of smoke with soaked fruit wood chips. Smoke until the salmon is done to your liking. You can also hot smoke the salmon, but the texture will be more flaky. For the smoked cheese: Cut pieces of gouda, swiss, sharp provolone into small blocks (4-8 oz each.). 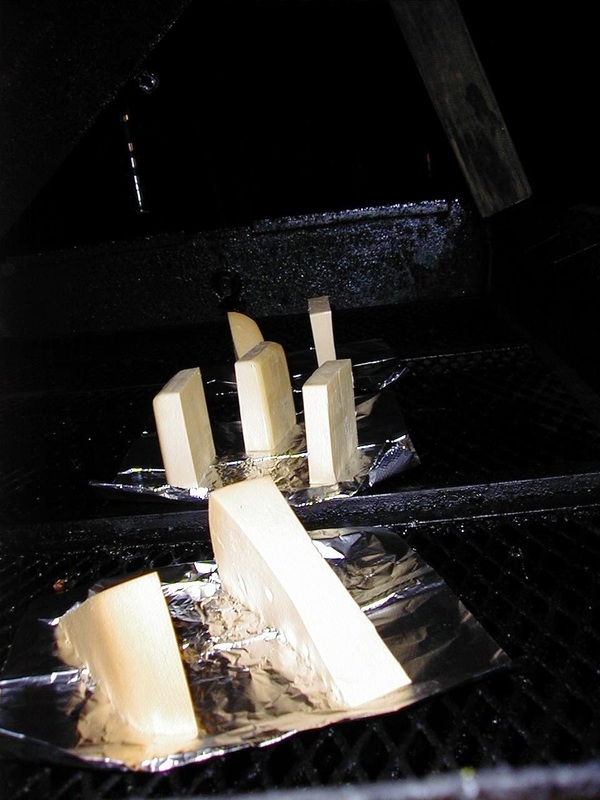 Place foil on the smoke grill. Lay down chopsticks to allow smoke to circulate around the cheese. Place cheese blocks on top of the chopsticks. Keep the smoker very cool, but smoky. Make sure the cheese does not melt or render its butterfat. If it does, it is too hot. 1-2 hours is good for smoked cheese. For soft cheese: Heat 1 gallon of good, fresh whole milk to 86F in a non-reactive pot. Add 1/2t mesophilic starter culture. Stir well. Add 3 drops of liquid rennet to ½ c cool water. (supplies from http://www.getculture.com/) Mix well. Add 2-3 t of the rennet mixture to the milk. Stir well. Allow to stand for 8-12 hours. Milk will look like yogurt with clear whey. Sterilize a ladle, a colander and a piece of cheese cloth with boiling water. Line the colander with the cheese cloth. Ladle the curds into the colander. Fold the corners of the cloth up and tie. Hang this “bag” over a large pot for 8-12 hours until the cheese reaches your desired consistency. Place cheese in airtight container and refrigerate. Cheese is good for about 2 weeks. For the dip. 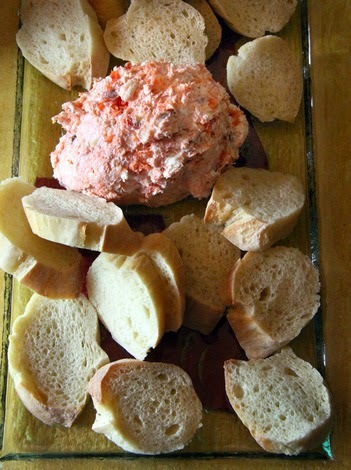 Shred 8 oz of the salmon and 4 oz smoked cheese into 2 cups of the soft cheese. Fold together so that flakes of salmon remain in the dip. If desired, salt and pepper or perhaps a pinch of crushed red pepper may be added. Good with crackers, or spread on a slice of sourdough toast and top with a few thin slices of fresh jalapeno pepper.